A key component of Vision 2030 is the National Renewable Energy Program (NREP), which is a a long term, multifaceted renewable energy strategy designed to balance the domestic power mix in order to deliver long term economic stability to KSA. This program aims to substantially increase the share of renewable energy in the total energy mix, targeting the generation of 3.45 gigawatts (GW) of renewable energy by 2020 and 9.5GW by 2023. To date, the program has tendered out three key renewable energy projects: a 300 MW solar PV plant in Sakaka and 2,400 MW wind energy plants in Midyan and Dumat Al-Jandal. In order to achieve the targets set-out in the program, additional projects will be tendered out over the next few years creating opportunities for public private partnerships, an effective approach that will help accelerate implementation of these projects and deployment of renewable energy solutions. The 300 MW Sakaka PV project received a lowest bid of 1.79 cents/kWh, the cheapest price ever recorded. Net-metering is an enabling policy designed to foster private investment in renewable energy. In August, the Electricity and Cogeneration Authority issued a regulatory framework for electricity consumers to operate their own, small-scale solar power (<2 MW) generating systems and export unused power to the national grid, offsetting this amount against their own consumption. As such, this creates a significant financial incentive and accelerates private sector investment in small-scale renewable energy applications. This will come into force in July 2018 and pre-qualified, registered installers must carry out the work in order for the system to be eligible. As of January 1, 2018, the Electricity and Cogeneration Regulatory Authority (ECRA) announced a threefold increase in the electricity tariff. For most residential users, they will now be paying 18 ha/kWh compared to 5 or 10 ha/kWh. The direct impact of this on users is an increased monthly electricity bill. At the same time, the increased tariffs will solidify the business case for renewable energy projects: instead of a payback period of ~10-15 years, small-scale solar PV deployments are now expected to have payback period of ~5-7 years, which is attractive considering the 25 year lifecycle of the system. Moreover, another policy incentive that could be deployed is a Time-of-Use tarrif where higher tariffs are applied for peak times, during the day which coincides with peak solar PV output. Technological advancements that have enhanced the output efficiency of solar panels have driven the cost of solar down significantly over the past 5 years. The price is expected to continually decrease due to further advancements in solar cell technology and energy storage and enhancements in solar cell manufacturing. On a more local level, two challenges that remain that limit the efficiency of the panels are dust and high temperatures. Research has been conducted into promising solutions to overcome these challenges such as electrodynamic screens, coatings and air blowers. These advancements will surely maximize the efficiency and output of solar solutions, while yielding significant financial gains and ultimately accelerating their wide-scale adoption. 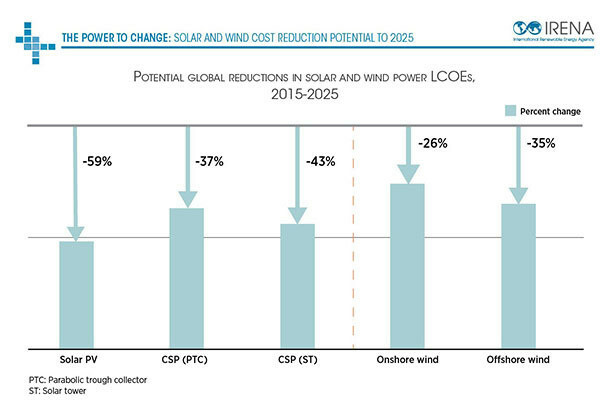 The levelized energy cost of Solar PV is expected to drop by 59% from 2015-2025. How can solar energy help India’s farmers?